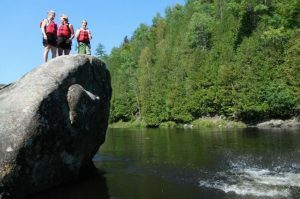 The Adirondac Rafting Company, in the Adirondack Mountains of eastern New York, has run whitewater rafting trips down the Hudson River for 20 years. For less than $100 you can raft all day down a 16 mile stretch, first the Indian River and then the Hudson River. These rapids are class III with a bit of class IV, so they are thrilling but not genuinely dangerous when you’re in the same raft as your experienced guide. The rivers normally run low, but on Tuesdays, Thursdays, Saturdays, and Sundays, the local dam releases water, which makes the river rise high and rush. 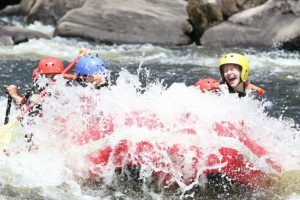 Rafting trips run from late April through September. You arrive to get a helmet, flotation vest, and paddle, then head out on a bus for five minutes to the launching point. Of course they have a small gift shop. The guides have great expertise and we were glad that, unlike at Letchworth State Park, that they went through the safety rules efficiently. We did have to carry the raft down to the water, and upon returning, back up, which is no big deal, but isn’t always necessary on a rafting trip. If you dare, you can jump from this rock during a stop on the trip. The Hudson River is a fantastic place to go rafting. As the water rushes around subsurface rocks (or rocks that stick out above the river), it creates tiny waterfalls and whirls that you zoom right on through. The raft bucks and you shout, “Woo hoo!” as you paddle for all you’re worth, get splashed in the face, and hold on for dear life. At times, when the river widens and deepens, so that rocks disappear, it’s safe for you to get out and swim along next to the raft. They even have a stopping place, Elephant Rock, where you can climb up and jump off into the water. We did stop for lunch on the tour, but it was basic, a cold turkey sandwich with potato chips, fruit gummies, cookies, and oranges. There are many competing rafting companies on the Hudson River, and of course they need to keep costs down, but the lunch was too small for adequate energy for a full day of paddling. 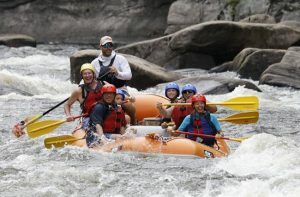 Because you’ll spend most of your whitewater rafting trip with your guide, ask for a guide who matches your personality. Our guide was friendly, professional, and safe. This was my fifth whitewater rafting trip, but the first time a guide actually taught us how to hold the paddles correctly and how to paddle efficiently — good to know! He even noticed and helped me correct my paddling technique during the day. However, our guide told us that he was a quiet person, and yes, he was quiet through our trip. This mismatched with our expectations that whitewater rafting is a high octane activity where the leaders are like summer camp counselors. They cheerlead you with oversized personalities, shouting, “Hey! How’s everybody doing today? Oh look, wahoo, there’s an eagle!” We didn’t get much of that from our guide. Being mellow has its pros as well as its cons. On the pro side, we had plenty of time to admire the natural beauty of ther river. Another guide from the same tour company seemed to talk constantly and irrelevantly, and I admit that I was glad that I was not in his group. On the con side, the silence made the time drag. Even the beautiful views of the the mighty Adirondacks become repetitive after a time, to tourists who are not committed nature enthusiasts. Our guide did not keep us going with storytelling about the river or through engaging the group in personal conversations. We seemed to take fewer opportunities than other rafts that would spin, “surf”, or intentionally hit a rocky stretch as stunts. We did get beached up on rocks a few times, which might have been partly because we could not hear our guide’s spoken but not shouted instructions. This continued throughout the day, even after we asked him to speak up for us. This left us confused at times what to do and not as effective a paddling team as we could have been. The Hudson River was beautiful, we thrilled to take on the rushing water, got good exercise, and even better photos and video. 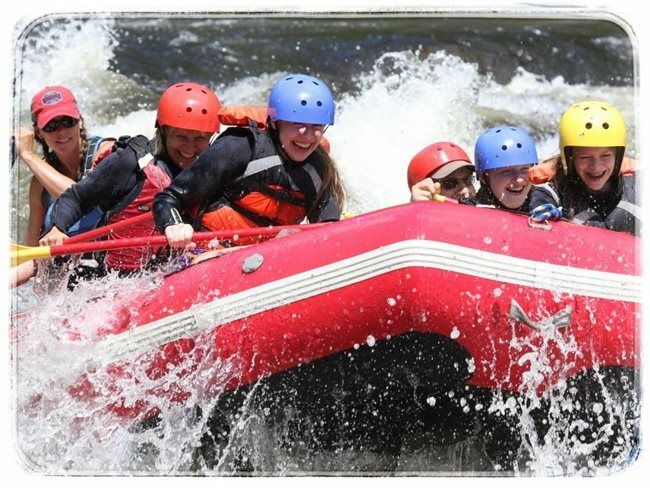 Whitewater rafting is not difficult to do and looks great in photos! It’s safe for children. So I do feel a bit guilty to single out one guide, but unfortunately, the guide makes the experience. My guest and I arrived at 9am, were ready for it to end by 2pm, and didn’t get back until 4:30pm. For enthusiasts, that is fantastic — a whole day on the river! — but for us, the amateurs, it was too much. The rest of our group seemed to feel the same, because near the end of the trip, the river widens and slows, giving you a choice of drifting slowly back to the bus, or paddling hard for 30 minutes to get back more quickly. As a group, we chose the paddling. We had had enough. 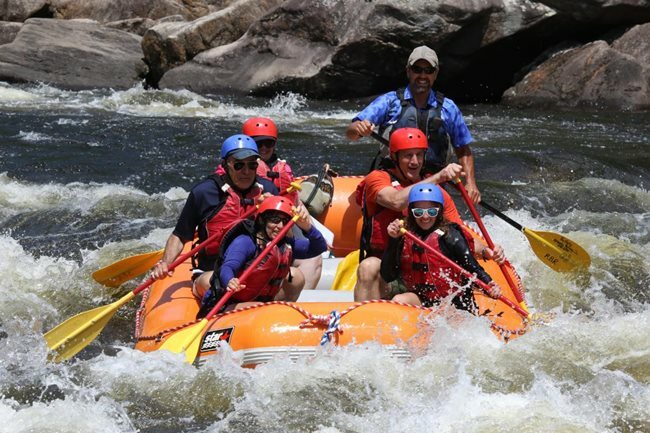 Whitewater rafting is a unique, bucket list activity that everyone should try! It’s painful to not give a full 5 stars. Obviously, the Adirondac Rafting Company works with dozens of guides throughout their season, and our guide might have been having on an off day. But for the trip that we experienced, only 4 stars to the Adirondac Rafting Company: solid but not perfect.